Airflow through a building can have a powerful impact on our level of comfort in our home, the quality of air we breathe, and the resulting energy bills. In fact, study after study demonstrates that air leakage can cost you over 30% more on heating and cooling expenditures, while also contributing to health and safety problems. Blower door testing can help solve these issues by providing a way to quantify airflow, detect energy loss, and pinpoint air intrusion. Many newer homes in the area have major issues regarding their inability to be cooled or heated efficiently. The owners report hot or cold spots, in addition to excessive energy bills. The first step in addressing these problems is to test if the building is sealed properly. 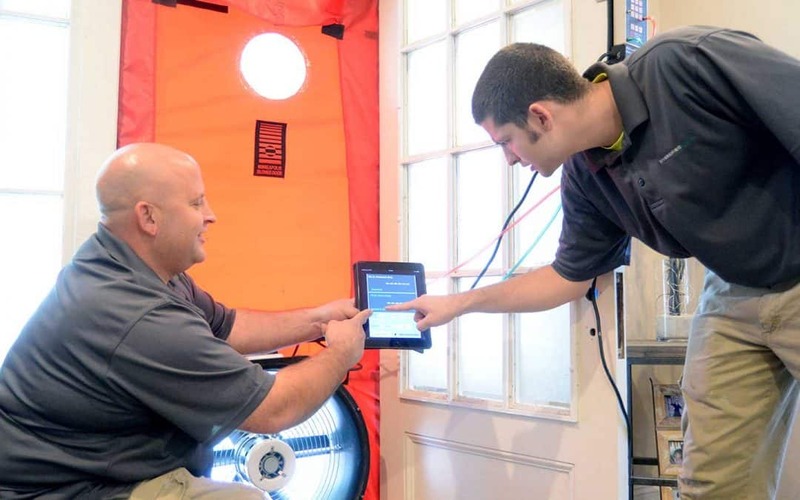 In a procedure called Blower Door Directed Air Sealing, Diversified Energy helps to identify and repair the leaks in these affected homes and businesses. DID YOU KNOW? : Blower door tests should be conducted on all new construction to ensure a tight energy efficient envelope. If you’re building a new home, the best time to conduct a blower door test is after the home is insulated, but before the drywall is hung. If the test reveals major problems, the leaks will be easier to fix at that point rather than later on. Of course, the DE360 energy audit offers the most detailed energy efficiency analysis.